Pacific Conservatory of Music invites all who enjoy saxophone music or wish to become better saxophonist. This free master class will be taught by Kenneth Radnovsky. He is a Selmer Artist who appeared as a soloist with leading orchestras including Leipzig Gewandhaus and New York Philharmonic. He is also president of the Boston Woodwind Soviet and co-founder of the Amram Ensemble. 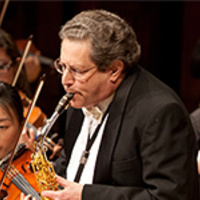 Highlights of his career include recording Debussy's Saxophone Rapsodie with the New York Philharmonic, a recording of film music featuring solo saxophone with the Hollywood Bowl Orchestra, and the commission and premiere of nearly 100 new works by composers such as Schuller, Babbit, Harbison, Amram and Colgrass. Mr. Radnofsky will give a short recital and work with Conservatory saxophone students.